Late last month, American thrash unit Skeletonwitch thrilled fans not only with the announcement of an early fall tour, but with news that they would be out on the road in support of a new album called Forever Abomination. At the time, not much was known about the disc save its title, but the troupe have now confirmed the album's October release. 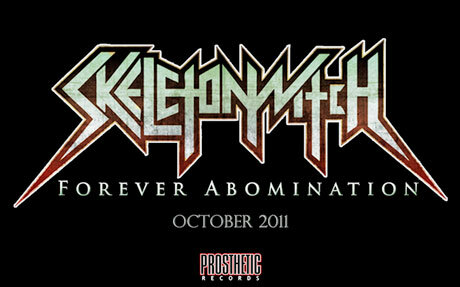 A press release from the group's label Prosthetic reveals that Forever Abomination, which was recorded by metal producer extraordinaire Matt Hyde (Slayer, Hatebreed), will hit store shelves on October 11. A tracklisting has yet to pop up for the platter, but the group will be unveiling all sorts of info, from pre-order details to band and album updates, on the newly launched Foreverabomination.com. Don't forget to check out the tour dates, which have them opening all across Canada for Arch Enemy and Devildriver, here.